Grant us, Lord our God, that we may honor you with all our mind, and love everyone in truth of heart. Through our Lord Jesus Christ, your Son, who lives and reigns with you in the unity of the Holy Spirit, one God, for ever and ever. According to the 1962 Missal of St. John XXIII the Extraordinary Form of the Roman Rite, today is the feast of St. Andrew who was born in the fourteenth century in Florence, Italy. He fell into bad company; but soon, touched by the grief of his mother, the young nobleman entered the Carmelite Order. Having served as prior of his convent, he was chosen to fill the vacant bishopric of Fiesole. He continually helped the poor, doing so in secret in the case of those who were ashamed to make known their distress. By showing his people the true nature of Christian peace, Bishop Andrew put an end to a number of troublesome disturbances in the city. He died on the feast of the Epiphany, 1373. 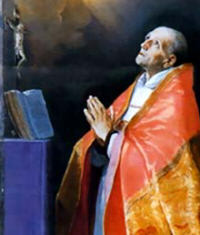 St. Andrew Corsini lived from 1302 to 1373. While still carrying him in her womb, his mother dreamed she had given birth to a wolf that sauntered to the gate of the Carmelite monastery, and entering the vestibule of the church, was changed to a lamb. Andrew was reared as a pious and God-fearing youth, but little by little he succumbed to the pleasures of the world in spite of frequent warnings and reproofs from his mother. After he became aware that his parents had vowed him to the service of Blessed Mary, he mended his ways and at the age of seventeen entered the Carmelite Order. Though persistently tempted and assailed by the devil, he never swerved from his holy decision. A man of austere penance, he fasted continuously, always wore a hair shirt, and prayed the penitential psalms daily. For humility's sake he often washed the feet of the poor and beggars. His special gift from God was the grace to effect the conversion of hardened sinners. In 1360, despite his efforts to the contrary, he was made bishop of Fiesole in Tuscany. Symbols: Holding a cross, with a wolf and lamb at his feet, and floating above a battlefield on a cloud or a white palfrey. Pray to St. Andrew Corsini that your children, especially teenagers, may find their true vocation and follow it faithfully. St. Andrew's fellow Italians often sought his aid in solving the disputes which had split their families and cities — imitate this peacemaker, renowned for his prudence and wisdom, by sowing peace in your own home. Born of the blood royal of France, herself a queen, Jane of Valois led a life remarkable for its humiliations even in the annals of the Saints. Her father, Louis XI., who had hoped for a son to succeed him, banished Jane from his palace, and, it is said, even attempted her life. At the age of five the neglected child offered her whole heart to God, and yearned to do some special service in honor of His blessed Mother. At the king's wish, though against her own inclination, she was married to the Duke of Orleans. Towards an indifferent and unworthy husband her conduct was ever most patient and dutiful. Her prayers and tears saved him from a traitor's death and shortened the captivity which his rebellion had merited. Still nothing could win a heart which was already given to another. When her husband ascended the throne as Louis XII, his first act was to repudiate by false representations one who through twenty-two years of cruel neglect had been his true and loyal wife. At the final sentence of separation, the saintly queen exclaimed, "God be praised Who has allowed this, that I may serve Him better than I have heretofore done." Retiring to Bourges, she there realized her long-formed desire of founding the Order of the Annunciation, in honor of the Mother of God. Under the guidance of St. Francis of Paula, the director of her childhood, St. Jane was enabled to overcome the serious obstacles which even good people raised against the foundation of her new Order. In 1501 the rule of the Annunciation was finally approved by Alexander VI. The chief aim of the institute was to imitate the ten virtues practised by Our Lady in the mystery of the Incarnation, the superioress being called "Ancelle," handmaid, in honor of Mary's humility. St. Jane built and endowed the first convent of the Order in 1502. She died in heroic sanctity, 1505, and was buried in the royal crown and purple, beneath which lay the habit of her Order.